“France Bringing the Faith to the Hurons of New France”. Anonymous. The painting “France Bringing the Faith to the Hurons of New France” was originally installed in the Jesuit Chapel, located where Quebec City’s town hall stands today. 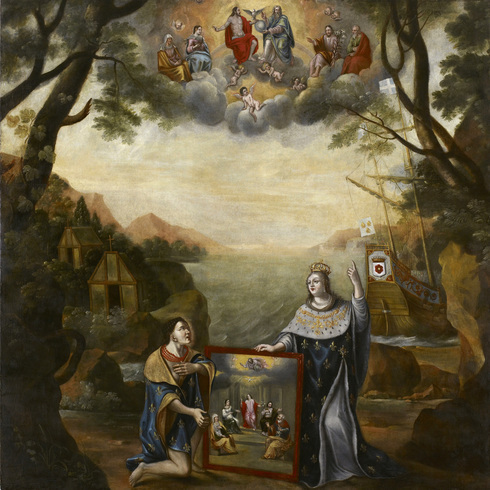 After the death of the last Jesuit in Quebec, the painting was entrusted to the Ursulines, as they had shared in the Jesuit’s mission of evangelizing the Native Americans. As the Native Americans did not know how to read, images were often used as tool of evangelization. This painting, however, has a secret: in 2008, restoration experts discovered that the angels were “clothed” in clouds only after the painting was transferred to its new owner!